During an afternoon with a brief break from the rain my husband decided to mow our yard or more fitting the jungle that was replacing my yard. 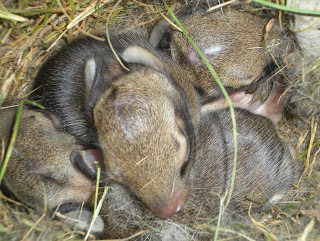 As he was mowing he made a discovery of a burrow filled with three tiny hairless wild bunnies. They really where not so adorable on day one, but day two to my amazement they had gained some hair, and where starting to look more like rabbits. I have been checking on them daily to make sure they are looking healthy. Since I am not likely to see the doe rabbit during the day. She stays away from the nest for the most part only attending to babies a couple minutes a night. 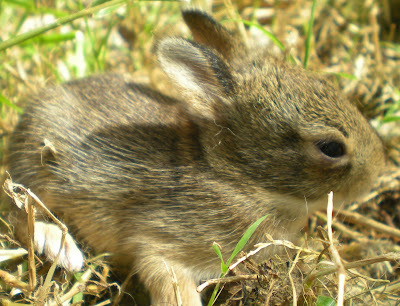 Contra to what some believe wild rabbits will not reject their offspring if they are touched by humans. Still I have thought it best to disturb them as little as possible. It has been a pretty amazing to be able to wittiness the growth of the babies, and how quickly that growth has taken place, and I thought my kids where growing up to fast! I am pretty sure that Momma rabbit is still attending to them and doing her job for they are becoming more and more active everyday. Poking their little heads out of the fur and grass mixed nest to checkout the world around them. They even hop around at the sound of foreign sounds when I come near. Finally they day came when there little eyes where open wide, and ears where standing straight up. They are just so sweet. Pretty amazing at what unexpected surprises you can find in your own backyard. The miracle of life, and the blessing of the world all around us. Sometimes we just need to take a closer look!